CHICAGO – February 7, 2019 – Executives with Harley-Davidson Motor Company (NYSE: HOG) and Tuscany Motor Co., a Fox Factory Holding Corp. (NASDAQ: FOXF) (“FOX”) subsidiary, today introduced the 2019 Harley-Davidson F-150 pickup truck at the Chicago Auto Show. A concept of the Harley-Davidson branded truck was displayed at the Harley-Davidson 115-year Anniversary celebration in Milwaukee. 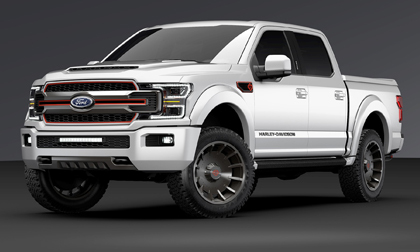 Strong reaction to the truck led to the collaboration for an all-new Harley-Davidson F-150. The public can see this exciting new vehicle, which is displayed in Ford Motor Company’s exhibit, from February 9-18.